Superior comfort in the ultimate low-profile, touring seat for two. The Weekday 2 up seat features a wide, supportive bucket seat for the driver, with a slim, contoured rear seat. Hand laid fiberglass seat pans provide strength, flexibility and conform to frame contours for low, lean look. Premium injected foam is process controlled to ensure proper comfort and support to the rider. Not too hard or too soft as found in other competitor's seats. Fine grain leather is used in seat surfaces, with premium grade vinyl used in side panels. Fully felted bottom to protect painted surfaces. Shipping Costs: We will add shipping costs to your order and charge you shipping only at actual cost. All order within the Continental United States are shipped via UPS ground or Fedex ground. UPS 3-day Orange or 2-day Blue Label available for rush orders. COD Orders: At this time we can not accept COD orders for Russ Wernimont Designs products. Softails Seat for RWD Tank : Superior comfort in the ultimate low-profile, touring seat for two. The Weekday 2 up seat features a wide, supportive bucket seat for the driver, with a slim, contoured rear seat. Hand laid fiberglass seat pans provide strength, flexibility and conform to frame contours for low, lean look. 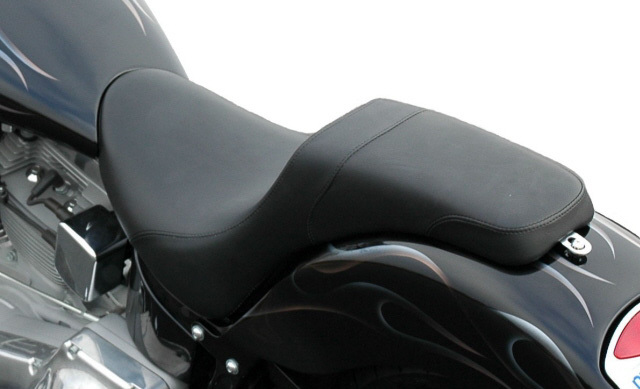 Premium injected foam is process controlled to ensure proper comfort and support to the rider. Not too hard or too soft as found in other competitor's seats. Fine grain leather is used in seat surfaces, with premium grade vinyl used in side panels. Fully felted bottom to protect painted surfaces. Orders on any special ordered items cannot be canceled. Cancellation of other orders must be received prior to shipment. Not all products are available for immediate shipping. If you require expeditied shipping, please state this in the Special Instruction section of your order form. Items temporarily out of stock will be shipped automatically when available unless you request NO BACK ORDERS. American Side Road Cycles sale of Russ Wernimont Design's products is without warranty, expressed or implied. American Side Road Cycles will warrant a Russ Wernimont Designs manufactured defect for one year. American Side Road Cycles shall be liable only for the value of the item warranted. American Side Road Cycles and Russ Wernimont Designs is not responsible for failure of any product that results from normal wear and tear, misuse, modification or improper installation. American Side Road Cycles and Russ Wernimont Designs reserves the right to inspect all returned items for conformance to our stated warranty policy. Chrome plating is a delicate cosmetic finish and is not designed for long lasting use in billet aluminum or steel parts. 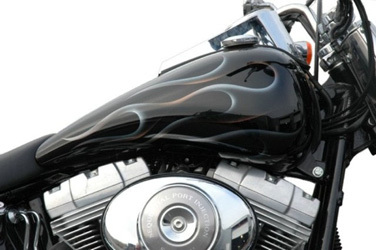 Chrome Platers will only warranty their chrome plating until it is installed on a motorcycle or other vehicle. NO CHROME WARRANTY AFTER INSTALLATION! You should expect tiny blemishes or scratches on chrome. Chrome Platers can only strive for perfection. Once a week or after every ride, use a good chrome cleaner to remove road dirt and other contaminants to help protect your chrome. The following is a list of chemicals that will damage your chrome plated part: Battery acid, brake fluid, transmission fluid, dust residue from brake pads and power steering fluid. RETURN POLICY Read Completely Prior to Opening / Installing Part(s). Parts lost or damaged in shipment are not the responsibility of American Side Road Cycles or Russ Wernimont Designs. If your part(s) are damaged or lost during shipment, you must contact the delivery carrier and file a claim within 24 hours. For packages damaged during shipment, save the box and packaging materials until the package can be inspected by the carrier. American Side Road Cycles must be notified WITHIN 72 HOURS OF RECEIPT OF SHIPMENT, AND PRIOR TO INSTALLATION, of any and all damages / discrepancies to your shipment. Please note: Claims for damage outlined below WILL NOT BE VALID once the part has been installed. Inspect each part thoroughly for dents, chips, scratches, gouges, flaws, etc. and report any such damage to American Side Road Cycles by e-mail within 72 hours of receipt. Return requests for dents, scratches, flaws, etc. will not be allowed after 72 hours of receipt or if an item has been installed. Returns will not be accepted without pre-authorization from American Side Road Cycles. You must contact American Side Road Cycles for a Return Materials Authorization Number (RMA). The RMA must be clearly marked on the outside of the package. Packages without the RMA on the outside of the package will be refused. A RMA does not indicate warranty approval. Approval / disapproval will be determined after our physical inspection of the returned part(s). Parts must be re-packaged carefully in our boxes with our packaging to prevent damage. The Customer is responsible for merchandise damaged in shipping due to inadequate packaging. Shipment will not be accepted freight collect. American Side Road Cycles is not responsible for freight charge on returns. Non-warranty claims will be subject to exchange only. Request to return product must be arranged within 15 days of the invoice date and are subject to a 20% re-stocking fee and all freight charges. Returned products must be in absolutely new and unused condition. Installed parts are not returnable, except for warranty issues as stated above. Returns will not be accepted without pre-authorization from American Side Road Cycles. Contact American Side Road Cycles for a Return Materials Authorization Number (RMA) and clearly mark the number on the outside of the package. Packages without a RMA will be refused. Parts must be re-packaged carefully in our boxes with our packaging to prevent damage. The Customer is responsible for merchandise damaged in shipping due to inadequate packaging. Shipments will not be accepted freight collect. American Side Road Cycles is not responsible for freight charges in returns. Non-warranty claims will be subject to exchange only. Parts must be re-packaged carefully in our boxes with our packaging to prevent damage. The Customer is responsible for merchandise damaged in shipping due to inadequate packaging. We suggest returns be shipped in a manner that provides the shipper with tracking ability so receipt can be verified. Shipment will not be accepted freight collect. American Side Road Cycles is not responsible for freight charges on returns. Russ Wernimont Designs products are not DOT approved or EPA approved. Some of these items could affect or void your manufacturer's warranty.